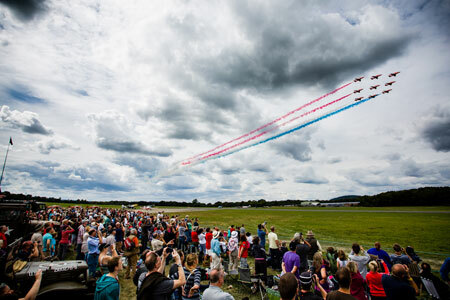 The 10th Wings & Wheels Show basked in sunshine over the weekend as more than 40,000 visitors turned up on Saturday 23rd and Sunday 24th August to enjoy the event. The Chinook opened the air display both days with their exciting, high energy manoeuvres before the Mitchell soared through the sky in the first of the historical aircraft with close links to the Aerodrome. Eight aircraft from the Second World War made a fitting tribute to the 70th anniversary of D-Day as the Old Flying Machine Company’s Spitfire and Mustang, Aces High Dakota DC3 and the RNAFHF B25 Mitchell flew in the first part of a unique formation. The crowd fell silent both days as the second part filled the sky led by a once in a lifetime formation made up of the Canadian Lancaster and BBMF Lancaster, Spitfire and Hurricane. On Saturday a formation by the Vulcan and Gnats display team continued the Show’s tradition of arranging one off and interesting flying combinations. The Red Arrows marked their 50th display season with a faultless performance on Sunday, also marking the Aerodromes’ 40th anniversary of the first time the Hawk flew from the site. The five hour air displays were not only packed with action from The Blades, Breitling Wingwalkers, Midair Squadron Canberra and Hunter but also by explosions which rocked the arena thanks to a stunning display of pyrotechnic power by the Apache Attack Helicopter Display Team. Brooklands Museum took to the Top Gear track with over 220 cars each day including a mix of modern and classic cars from the Porsche, TVR, Ferrari, Ford GT40 to the stunning Napier-Railton Special and Railton Terraplane Sport Tourer. Dunsfold’s resident Boeing 747 in the ‘Wings Park’ opened for tours as visitors also flocked to the newest addition to the Aerdrome, the VC10 owned by Brooklands Museum. Another new addition to the Show was a morning slot for remote controlled aircraft, including the 1/4 scale Red Arrows Hawk models flown by father and son duo Steve and Matt Bishop. The Stunt Zone returned with The White Helmets performing spectacular feats of balance, death defying crossover rides and outstanding acrobatics on their hand built British Millennium Triumph 750cc motorcycles supported by modified car club South Evolution. The military vehicle and car parades showcased the assortment of wheels the event had attracted, whilst the re-enactment battles from the Screaming Eagles went off with a bang. Jamie McAllister, Event Director comments: “We are delighted with the success that Wings & Wheels has become, it has grown tremendously since the first event in 2005. So much so, that for the first time in the Show’s history, we had to make the difficult decision to stop on the day ticket sales on Sunday to ensure the continued enjoyment of those already at the event. Wings & Wheels is promoted by Dunsfold Park Limited and in 2014 assisted the fundraising efforts of Brooklands Museum Trust and Help for Heroes. These superb jet aircraft always thrill the crowds at our static Thunder Day events, but the fast taxi is something extra special and a chance to hear the full majesty of the Victor’s four mighty Rolls Royce Conway engines. Runway activities commence at 13:00pm. Admission to the event is at normal museum admission rates of £8 Adults; £6 Concessions and £4 Children, but, for those wishing to access the airfield viewing area for the fast jet taxi runs, a special pass will be available priced at £10 per person. However, as we are aware that families will be attending this event, there will be no charge for the airfield viewing for under 16’s, as long as they are accompanied by an adult with an airfield pass. Proceeds from this go straight towards the purchase of fuel to keep these historic icons of the sky in ground operational condition for the public to enjoy. A brand new exhibition uncovers one of Britain’s forgotten heroes. Sir Alan Cobham was a true aviation pioneer both in the air and on the ground. 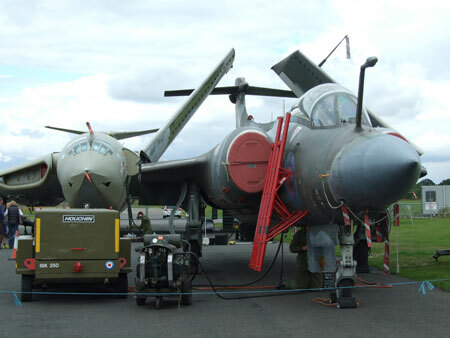 Amongst his many contributions was the ‘Air to Air’ refuelling technique still used by air forces across the globe today. Sir Alan Cobham was one of the biggest celebrities of his day. Brave, visionary and innovative – he was a record setter whose legacy still holds to this day with an aerospace company that provides technology to air forces around the world. Famous for landing his seaplane on the River Thames in front of the Houses of Parliament, he learned to fly during the First World War and later went on to set many long distance aviation records. These include becoming the first person to fly from London to Cape Town and back in 1926 for which he received the Air Force Cross, and in the same year to be the first person to fly from London to Australia and back, for which he was knighted by King George V at the age of 32. Sir Alan Cobham also organised a series of flying tours of the United Kingdom, Ireland and South Africa which became affectionately known as ‘Sir Alan Cobham’s Flying Circus’. These tours promoted aviation to the public and were a source of inspiration for countless pilots in the Second World War. This new exhibition will be opening on the Museum’s Battle of Britain Day on the 14th September. It will be a highly visual display of Sir Alan Cobham’s life and his many notable achievements, showcasing some of the ‘treasures’ from the collection including a Union Flag that was flown on Cobham’s de Havilland D.H.50J biplane while on his Cape Town flight. The exhibition will also feature film footage that will show how he made aviation into a breathtaking spectacle. The ‘Sir Alan Cobham Collection’ forms the basis of this new exhibition. This Collection may be viewed by appointment in our London Reading Room. Vulcan confirmed but with a twist! The last airworthy Avro Vulcan will be putting on a powerful display as she returns to Wings & Wheels on Saturday 23rd and Sunday 24th August this summer. She won’t be alone though as on Saturday the Show has another special formation planned with the Vulcan and three Gnats of the Red Gnat Display Team performing a flypast. The Vulcan to the Sky’s Avro Vulcan XH558 is the only flying example of the country’s powerful V-Force. Painted in “anti-flash” white, XH558 was delivered on 1st July 1960, from the factory at Woodford, near Manchester, to RAF Waddington near Lincoln. 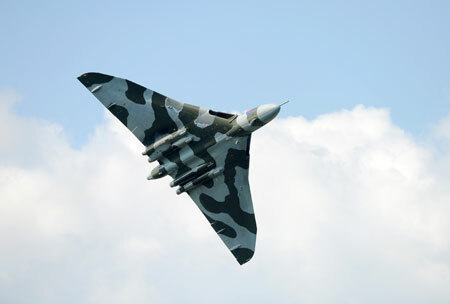 XH558 was the first Vulcan B.Mk2 to be delivered to the RAF, and she is now the oldest complete Vulcan in the world. XH558 was also the last Vulcan to leave RAF service, flying on from 1986 to 1993 as the single RAF Display Vulcan, a career spanning 33 years. Her final flight was on 23rd March 1993 to Bruntingthorpe Aerodrome in Leicestershire, having been sold off by the Ministry of Defence to C Walton Ltd, a family firm which purchased and maintained her. In 1997, a small team, headed by Dr Robert Plemming, put together an audacious plan to return her to flight which took place in October 2007. The Red Gnat Display Team is part of The Heritage Aircraft Trust (a UK registered Charity), dedicated to the restoration and conservation of classic historic aircraft. Its home base is at North Weald Airfield near London in Essex. The team currently consists of three Folland Gnat T. Mk1 aircraft expertly maintained and displayed and is the only civilian supersonic jet aerobatic display team on the air show circuit. Airbourne 2014 enjoyed a record year with its biggest ever crowd this weekend. With higher than usual visitors throughout the four days, the biggest ever crowd proved to be on Saturday with an unprecedented number of visitors. 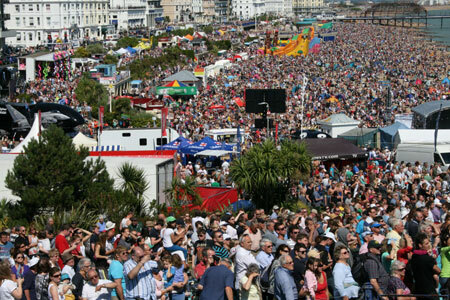 Hundreds of thousands of visitors lined the seafront to get a glimpse of the Red Arrows 50th anniversary display the world’s first public display of two Lancaster bombers in formation for over 50 years. Programme sellers and the information tent along with various other places were extremely busy as programmes sold out by the end of the weekend, along with car parks around the town which were at full capacity as hundreds of thousands flocked to the seafront for the event. Airshow fans from more than 60 countries watched Airbourne streamed live on line with over 1,000 viewers at any one time. As well as record crowds, Saturday proved to be a day for romance with a marriage proposal on the Airbourne Live stage, also broadcast live on the big screen. Paul Neill travelled over 1,000 miles at the last minute to be with girlfriend Emma Cox, and surprised her with a public announcement in front of thousands on the beach. Airbourne was also the favourite photo spot for newlyweds who came straight from their wedding to get a picture with Optimus Prime and the Red Arrows. Sunday evening saw an impressive crowd as thousands gathered for the Airbourne finale of fireworks sponsored by Frontier Fireworks and Ansvar. Crowds came early to enjoy the O’Briens Flying Circus Display take flight and to watch the entertainment on the new live stage with Heart and acts such as Hot Detroit, The Mend and headliner Luke Friend from X Factor. Fans also enjoyed Canditron before the fireworks, a fantastic dancing robot display. The live stage was also a hit the rest of the days with Jamie Laing, De’Vide, Fo Sho’s, SS4A Street Dance squad, Steve Hewlett and many others drawing the crowds between flying displays. Fans were also glad to see a fantastic tri-service area and ground attractions on the Western Lawns, Wish Tower Slopes and beaches as well as the popular BBC World War One at Home village. Sparks fly as Blades set to perform their first Night Air dusk display! In commemoration of the 74th anniversary of the Battle of Britain the museum will be hosting three very special lectures by Military Historians; James Holland, Peter Caddick-Adams and Stephen Bungay. The difference that made the difference in the Battle of Britain was Fighter Command’s unique Air Defence System. Many of the jobs in it were carried out by members of the WAAF. They were the first women in any military organisation to be placed in what was effectively the front line. Stephen Bungay will talk about who they were, what they did and why it mattered. In this talk, James Holland takes a fresh look at one of the most iconic episodes in British history, examining the story that has been passed down into folklore and assessing the performance of both sides. In so doing he will be asking whether Britain’s victory in the summer of 1940 was even more comprehensive and significant than perhaps is widely thought. Peter Caddick-Adams will contrast the operational commanders, Dowding and Goring, and examine how concepts of leadership within the two opposing air forces were quite different. Daniel Albon, curator of the ‘Sir Alan Cobham’s Flying Circus’ exhibition will give a free lecture to officially open the exhibition to the public. This hour long lecture will feature footage from the Battle of Britain film and a personal tour of the exhibition which opens on 14th September 2014. Sir Alan Cobham was a pioneering long distance aviator and technical innovator who became famous for his exploits in the interwar years by making aviation accessible and popular throughout the world. The Wings & Wheels press launch got off to a sunny start today (12th August 2014) as the Aerodrome’s resident DC3 took to the skies with the Old Flying Machine Company’s P-51 Mustang to kick off the 10 day count down to the Show.Well known for adding a little extra magic in the air with some memorable and unusual formation displays, Wings & wheels confirmed that a very special tribute is planned to commemorate the 70th anniversary of D-Day. Eight aircraft from the Second World War will grace the skies above the Aerodrome in a two section flypast. Section one will comprise of the Old Flying Machine Company’s Spitfire and Mustang, Aces High Dakota DC3 and the RNAFHF B25 Mitchell. 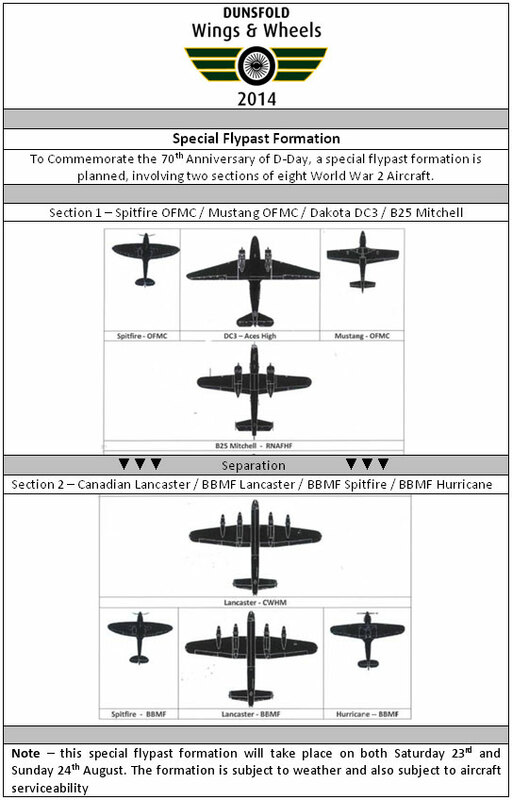 With a separation, section two will be formed by the Canadian Lancaster and BBMF Lancaster, Spitfire and Hurricane in section two. All these aircraft have history with Dunsfold Aerodrome as well as having played vital roles in the Second World War and will display on both days. Brooklands Museum had an assortment of vintage vehicles including the 1907 Berliet-Curtiss Racer and more modern GT40’s and Jaguars. Surrey based modified car club South Evolution took to the track in Minis, Mazdas and a 2 litre Mitsubishi Eclipse, a replica of the car Paul Walker drove in the very first Fast and Furious movie. Wings & Wheels was also delighted to announce the Brooklands Museum VC10 will be open for public tours over the Show weekend and gave press a sneak peek. Tours will be limited and available to pre-book over the weekend on a first come first serve basis. A donation of £2 per person is suggested and will go towards the on-going restoration of the aircraft. Aviation fans from across the country are being given the chance to sit inside some of the world’s most historic aircraft at the Open Cockpits Evening being held at the Royal Air Force Museum Cosford next month. Just 300 tickets are available for this exclusive evening on Saturday 20 September, where a wide range of aircraft will be available for close viewing on the night: including transport aircraft, jet fighters and unique research airframes. Aircraft enthusiasts will be able to get a feel for what it was like to fly these much loved machines by entering their cockpits and enjoying a Pilot’s view. In addition to this, visitors will have exclusive after-hours access to the Museum which displays a collection of over 70 aircraft, military vehicles, engines and aviation artefacts within three wartime hangars and the award-winning National Cold War Exhibition. The aircraft open on the night will span the Museum’s entire collection ranging from research and development aircraft often produced in secrecy and built to test a new theory, to war planes that have seen action in several conflicts. 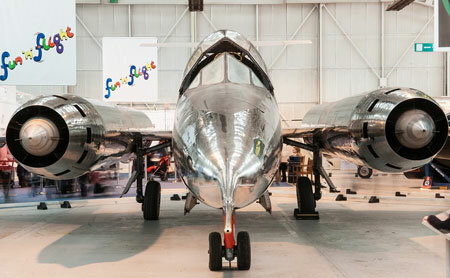 Research and development aircraft will include the Bristol 188, built mainly of stainless steel and designed to investigate the effects of heat on aircraft structures at very high speeds and the Saunders-Roe SR53 interceptor which used a rocket motor to climb rapidly to high altitudes. Fans of the modern jet will have the opportunity to sit inside the Harrier GR9, often referred to as the Jump Jet. This famous family of British-designed military jet aircraft were capable of vertical/short take-off and landing operations and only retired from operational service with the RAF in December 2010. Much older aircraft will include the Focke-Wulf Fw 190, a German fighter aircraft widely used by the Luftwaffe during World War Two. So whether you’re interested in seeing how manufacturers were pushing the boundaries of aircraft design or you’re keen to see up close aircraft that have served in conflicts across the globe, there will be something for every aviation fan to enjoy. The event, which is held twice a year in May and September, has been a complete sell out for the last five events and with less than half the tickets remaining, anyone interested in attending is encouraged to purchase their tickets soon to avoid disappointment. The evening will commence at 6.00pm and finish at 9.00pm, with numbers onto the Museum site strictly limited to 300 people – providing enthusiasts with three hours to examine the Museum’s historic and wondrous aircraft in an exclusive environment. Admission is by advance ticket only; tickets cost £12.50 per person and are available to purchase through the Museum’s website. Museum members price £10.00 per ticket (please note membership cards will need to be shown on entry to the event). Parking charges are included in the ticket price. Minimum height restrictions of 1.07 metres will apply. The Royal Air Force Museum has today launched a new website, rafmuseumstoryvault.org.uk, which enables members of the public to interrogate previously unseen Casualty Cards of members of the Royal Flying Corps who suffered injury during the First World War. In addition to these records online visitors are now also able to search the Muster Roll for the RAF as drafted on 1 April 1918 and the Air Force List as of 1 February of the same year. This online resource is the culmination of a three-year digitisation project involving over 10,000 hours of work by staff of the museum, who electronically preserved over 300,000 fragile records – all of which are free to examine for anyone with access to the internet.